The MArch Master of Architecture at AUB explores the possibilities of architectural practices that conceive and articulate diverse processes of community development and transformation. The MArch course is for you if you are looking for something different and fresh in your route to becoming an architect in a changing world. Our course explores the possibilities of new architectural practices that make, innovate and collaborate, exploring diverse processes of community development and transformation. MArch aims to produce: performative, projective enablers and architecture, cutting into societies deepest darkest myths; building interventions in the utopias and dystopias past, present and future; and launching architectural careers and journeys via its laboratory practice, where the body and somatic practice is at the fore. The periphery is important geographically, as from there you can see the centre. Both the urban region, the rural and the coast has a a great surface for interventions. Join the eclectic global and local, MArch student body, be ready to catch a big one from the Piers and the Portland Stone cliffs or disappear into the New Forest (Mirkwood) to live like a hobbit. The urban density of the AUB campus has seen the insertion of an amazing Drawing Studio by visiting professor, honorary fellow and alumni Professor Sir Peter Cook. 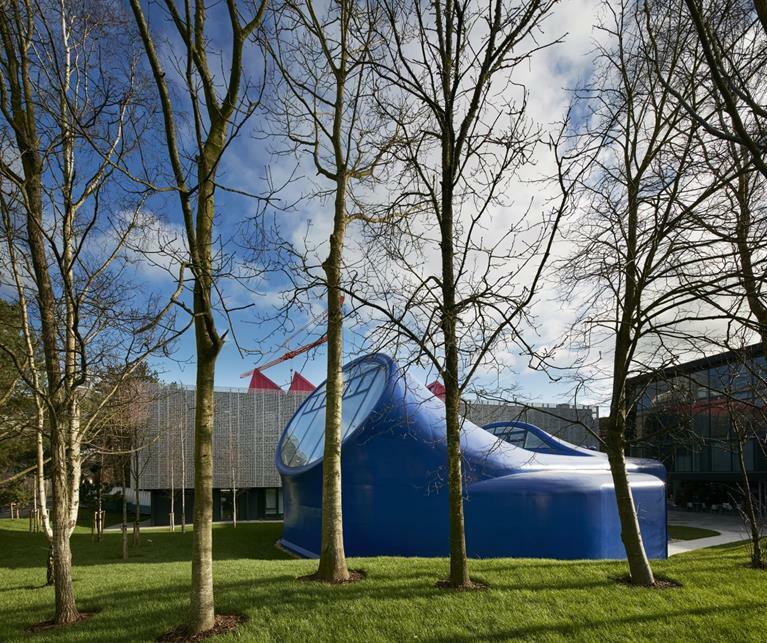 The RIBA award winning building was opened by Zaha Hadid. Her practice is now closely involved with the development of Pavilion Gardens in Bournemouth, the MArch is shadowing this work. At AUB, our studios work in a way that mirrors industry, with students working together in a high-energy environment. You’ll work in our recently renovated studios and have access to 3D workshops with manual and digital manufacturing equipment. You’ll also be able to make use of our makers lab – a shared creative space also used by Modelmaking students – and designed to give the the space to create. You’ll also be welcome to use the printmaking room – located with the Fine Art studios. Where, the University has gained a number of traditional presses, including letter press, etching, relief, lithography and silk screen printing. There are dedicated areas for exposure, screen washing and acid etching – and new presses are added all the time. Visit the MArch Master of Architecture (ARB/RIBA Part 2) page on the Arts University Bournemouth website for more details!